The results of recent ropeless gear trials do not show much promise as a viable option for lobster fishing area (LFA) 34 in the event of a North Atlantic right whale closure, not without a lot of tweaking. “This is a completely different way of fishing. Take everything you’ve known. Put it aside. 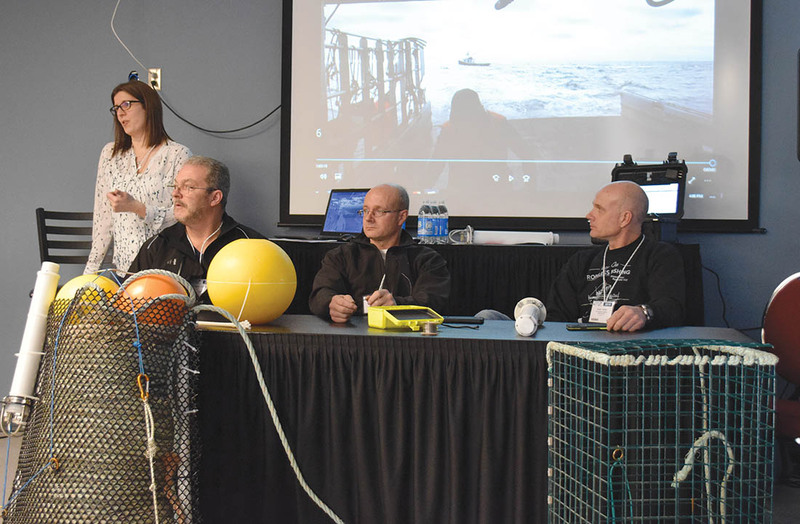 What we’re going to show is not what you know for fishing,” said Coldwater Lobster’s Heather Mulock during a seminar presentation at the Eastern Canadian Fisheries Exposition in Yarmouth on Jan. 25. 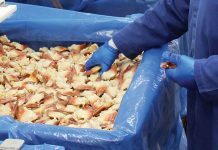 The Association conducted 23 at-sea trials using 10-pot trawls between late September and early November. Three vessels, two out of Pinkney’s Point and one out of Sanford participated. It was the first time the system had been used in a trawl fishery. After three days of training, the fishermen were ready to give it a try. Starting out, “we were all skeptics,” said Robert Harris, one of the boat captains. “By day five, we were starting to get used to it” and by day eight it was only taking a few minutes to get the float buoy back, he said. 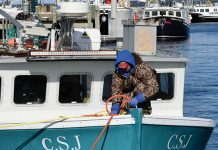 “As far as making our everyday fishery easier, it sure is not that, but if we’re told it’s the only option to access an area then it’s a possibility,” said Harris, estimating using the system would add four to six hours to the workday and the need for an additional crew member. 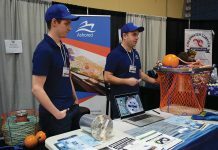 The Association developed 36 rope bags of various sizes to house the buoy lines, with Desert Star’s ARC 1XD acoustic release control unit strapped to the outside of bag. They also tried a cage unit. “It was really trial and error to see if it was going to work,” said Mulock. 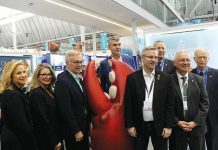 Harris said 98 per cent of the time, there was no problem with the technology, but the same can’t be said for the tides, which proved to be problematic when it came to retrieving the buoys. Spotty cell phone service was also a factor. “When weather was good it worked well,” he said, adding it if it’s going to be pursued, there are things that could be done to make it work better. Mulock said the cost of the ARC 1XD acoustic release control units at present is between $80,000 to $120,000 U.S.
“If it did go into mass production that could be reduced by 40 per cent but you’re still looking at $65,000 to $80,000 Canadian per boat. “From a cost perspective it’s a no go,” she said. The Grand Manan Fishermen’s Association and the Acadian Crabbers Association have also conducted at-sea trials with the Desert Star system, said Mulock, adding the three associations will be meeting with DFO in February to discuss the findings. A report on the Coldwater trials, written by a third party, has not yet been delivered to DFO, said Mulock. “The last line does say it could be an option but doesn’t appear to be viable for LFA 34. However, in other areas, particularly the Gulf, where whales are an issue it could be an option,” she said. 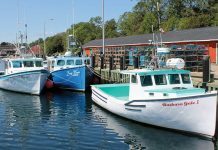 Mulock said it was important for Coldwater Lobster to take on this project because the whale issue is not going away. 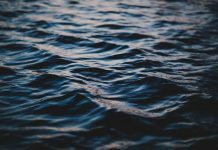 “The Marine Mammal Protection Act is a bigger issue,” she said, explaining that in 2016 provisions were set for countries exporting into the U.S. to meet certain standards. One provision is to have measures in place to protect marine mammals.